What are the things that we notice about the buildings where we work and sleep, shop, exercise and seek entertainment? Do they serve the function for which they are designed? Are they warm in the cold weather and cool in the hot weather? Is the lighting sufficient for our needs? Are they built with our comfort in mind? There are other things that we don’t notice immediately. We may not notice if they’re built out of sustainable materials or if they conform to the most current environmental standards. We are unlikely to notice if there is mold or dampness in parts of the structure where we don’t go. We might not always notice the behind-the-scenes concerns that are part of a building’s hidden performance. But what’s the first thing that you notice about a building? You notice how it looks. A traditional style of architecture for a building located in a trendy hot spot would seem out of place, just as a cutting-edge design would be ill-suited in a neighborhood of stately eighteenth century structures. Danpal’s façade materials allow a building to take on an appearance that can be customized to suit its environment, while adding marvelous color and texture options that give the structure a unique flavor. Lighting is an option that can be enhanced with façade materials. If you’d like to supplement the look of your building with depth to its perspective, you can layer different shades of color. Choosing from Danpal’s columns and brick stacks gives even more options. Design a building that people will notice by choosing façade materials. Studies have shown that people, whether in the workplace or in their homes, feel better and are more productive when they are in an environment which adds natural light to the setting. But you don’t need a study to tell you that. You already know that you see better, for one thing, when natural light is available. You feel better; your mood improves and you benefit from an attitude that takes its cues from the uplifting atmosphere of natural light. Façade materials benefit from Danpal’s pioneering daylighting architecture, which is an architectural way to include sunshine as part of your decorating design. Now that we’ve accounted for the many features of façade materials that you’ll notice in a building, it’s time to concentrate on what you might not notice right away, and that’s the strength. A building has to meet the expectations of its function; if it’s an office, a medical facility, a workplace or a residence, it conforms to the intended usage for which it was designed. But strength is a factor that contributes not only to the function, but also to the building’s stamina and life span. Danpal’s microcell technology has dramatically increased the strength of our building materials. That means that weather, one of the most powerful and potential damaging threats to a building’s wellbeing, is held at bay. That’s because our snap-lock connection system is designed to prevent snow, wind, hail and rain from invading your interior space. The impressive quality of our thermal insulation can do its job the right way, which allows your energy usage to perform the way it’s supposed to. Façade materials keep your insulation dry, which in turn keeps your energy usage efficient and your year-round temperature constant. What you may not notice about a building is important. That’s why Danpal notices these things for you. An architect, when designing a building, is always thinking about the future. How will the building stand up to the elements? What kind of building materials should be used so that the structure can remain strong and functional for a long period of time? What are the regulations that must be observed in order for the building to be in compliance with federal codes? Is the building designed with a style that is going to suit the location? All of this needs to be considered before the building actually takes its physical form. Choosing a building material from a reliable manufacturer known for quality products is vitally important; the building is only as good as what it’s made of. That’s why architects choose Danpal for the building materials that represent quality. A building has to be strong enough to withstand the punishing effects of weather, and Danpal, with half a century of experience and knowledge, represents quality in today’s market. We design products that will take your buildings into the future because they’re built to last. Our façade materials are one of the ways that a building can enjoy a longer life span, because façade materials protect against weather. How do you design a product that’s strong enough to withstand the fury of snow and wind, the power of a rainstorm, the endless force of the sun, and the battering of hail? If you’re Danpal, you devote resources to your research and development team so that they will create innovative products that are capable of defending a building against weather. Our façade materials have a snap-lock connection system that effectively stops the outside elements from invading a building. The double-click locking seam delivers a higher load resistance. The cell structure of our façade materials is what makes superior thermal insulation possible, enabling the building to protect its internal workings from the peril of weather. UV protection keeps the sun’s harmful effects from causing damage. You might think that something as strong as Danpal’s façade materials must be very heavy and cumbersome, but the exact opposite is true. Our façade materials are strong in function but light in weight. They’re flexible and easy to work with so that installation is quick and effortless. Saving time and money with Danpal’s façade materials is a smooth, smart process from beginning to end. Okay, so the building design is over and the installation is complete. Here comes the next question: how does it look? Danpal, a pioneer in daylighting architecture, has developed façade materials that can make natural light a feature of your indoor living and working spaces. You know how much easier it is to see with when you’re outside in daylight; now you can find out what it’s like to have that natural lighting at work inside. Natural light has benefits that extend beyond vison. Studies have proven that natural light enhances our mood; it promotes optimism and make us more productive. We feel better in natural light. Danpal façade materials can make it happen. You’d think it would be obvious: add daylight to the inside of a building for better lighting and enhanced atmosphere. It is obvious, but only Danpal has recognized how much daylight inside a building can transform a structure. With a half-century of experience in the building industry, Danpal has been a pioneer in daylighting techniques, holding fast to the belief that a well-designed building should offer as much natural light as possible. That’s why Danpal façade materials are such an advance in building products. Danpal, the first company to develop the Danpalon® translucent panel standing seam system, has three decades of experience in providing façade materials that are used all over the globe. Danpal proves that daylight travels well! Buildings are for people. Filling the living and working spaces with natural light gives people a workplace that’s more conducive to productivity because people are spending their day in a happier, healthier environment. Danpal’s philosophy is that developing solutions that meet visual, thermal, and energy needs should not exclude holistic benefits. Danpal feels that building designs should begin with an understanding of how the sun shapes our experience. Creating façade materials that follow through on this vison makes Danpal a leader in what we might describe as “user-friendly” buildings. The excitement that is created when daylight becomes part of the building toolkit has inspired a new perception about architecture. Natural light is regarded as usable square footage internally, which expands ways of capitalizing on the uses of the building project. What we’ve found is that light has a genuine effect on how people feel, think, and work. Imagine the possibilities if a building can actually be part of the wellness process that generates an improved attitude and sense of optimism. Danpal façade materials are highly regarded for their ability to resist weather as well as for their support of daylighting techniques. Danpal’s Microcell technology has a double-click locking seam that promises higher load resistance, with a snap-lock connection system to make weather stay where it belongs, which is outside, not inside. 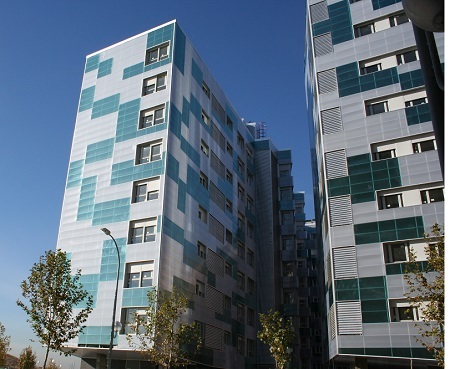 The cell structure of the façade materials possess high-quality thermal insulation. This means that façade materials made by Danpal can fight back when weather is at its most destructive. Another advantage to Danpal’s façade materials is the fact that they’re light in weight. This makes them easier to work with and to install. When a process is easier and simpler to accomplish, the end result means less money spent and less inconvenience experienced. Daylighting is one of our most famous esthetic features, but it’s not the only one. Color is another way of making your building stand out. Whether you decide to layer different shades of color, or alternate dark and light colors, you’re giving your building the opportunity to show just how much façade materials expand your creative options. Knowing the community in which your building will be located is the first step in determining what your building’s appearance should be. A building with a contemporary look in a block of traditional structures will indeed stand out, but perhaps not in the way that you would like. With a little research, you can design the building that looks just right! 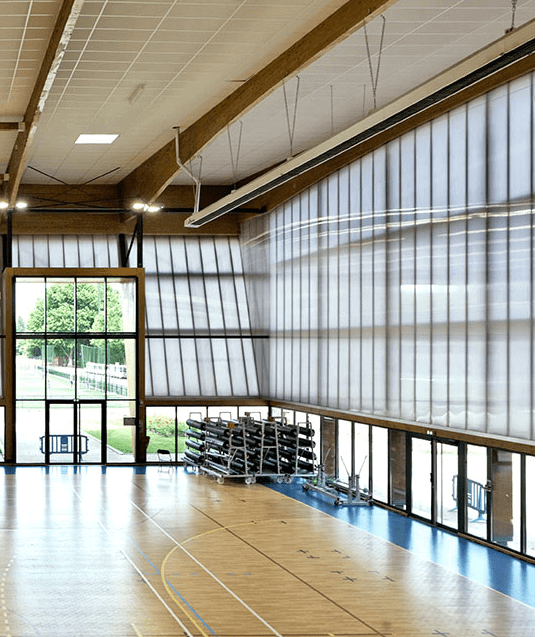 It’s no surprise that buildings which are constructed to incorporate natural light into the design have an advantage over the traditional structure that relies on artificial light for illumination. Natural light doesn’t just help us to see better; it also helps us feel better. Danpal’s facade materials show how cutting-edge technology and the ageless, timeless appeal of natural light can give a building the architectural edge. With glazed panels and tight spacing between the ribs, light is evenly diffused so that it’s exactly what the customer wants, not too much and not too little. The design is created so that the amount of light can be controlled. The integration of the conventional glazing can, depending upon preference, either reveal visual contrasts in the building or conceal a building’s less attractive features. Mother Nature provides the daylight, of course, but Danpal provides facade materials in a stunning array of colors. effects, finishes, and textures that architects enjoy working with. It’s a perfect match! No matter what season it is, the weather has quite an arsenal of weapons to challenge a building’s durability. What happens when it’s raining buckets? Or when there’s a heavy snowfall? What about wind? How about hail? You’re worried about leaks, impact, and damages, but with our facade materials, you don’t need to worry. The snap-lock connection system prevents air and moisture from penetrating the defenses of the facade materials. Microcell technology is designed to withstand the impact of hail. Danpal’s extended UV protections protects the building from the damage that sunlight can cause. The question of a building’s energy efficiency is one that is on an architect’s mind well before he or she begins designing the structure. 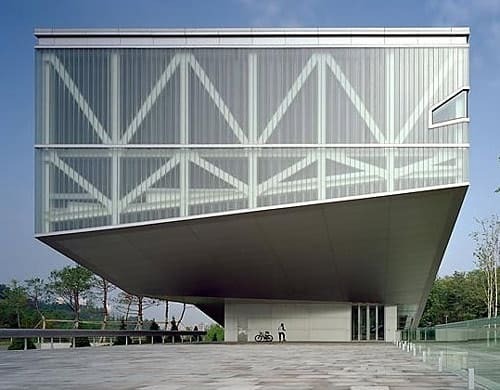 Danpals’s facade materials possess superior thermal insulation and improvements in the “V” and “R” values contribute as well to the overall high marks of the energy efficiency. The strength and beauty of Danpal’s facade materials are so impressive that customers sometimes forget about the other advantages of the products. For example, the panels are very light in weight, which makes them so much easier to work with and install. Danpal, which has been in the business for 50 years, has put its half century of experience to good use by emphasizing the importance of research and development. Operating on five continents, Danpal has five regional subsidiaries which contribute to the company’s state-of-the-art production process. That accounts for Danpal’s success in terms of its international market, but what’s just as important is the company’s commitment to global concerns. Paying attention to the environmental concerns that are a priority for today’s public has given Danpal an understanding of what customers want for the buildings in which they live and work. Our customers rely on us to deliver products that match their belief that a sustainable life is the best one for the generations to come. We build our buildings to last and we’re doing everything we can to make sure that our planet lasts too. If you’re on a quest to find something new in building materials, inspirations for exciting and innovative designs are as close as the nearest housing development. Before you lock yourself into the monotony of designing a building that looks like every other one, why not take a ride around the area to see what’s being built around you? You’ll be amazed to find the range that is available, particularly if you’re in a neighborhood where there’s a building that’s made out of façade materials. Never mind the same, boring old structure that’s build out of the same old boring materials. Danpal façade materials, because of the amazing array of colors that is offered, give a house a dazzling look. If it’s hard to imagine a building that delivers a sense of style, you’re in for a treat, because facade materials deliver remarkable, unique beauty. However, facade materials aren’t just esthetically attractive. Façade materials offer one of the most versatile investments that can be made in the housing field. 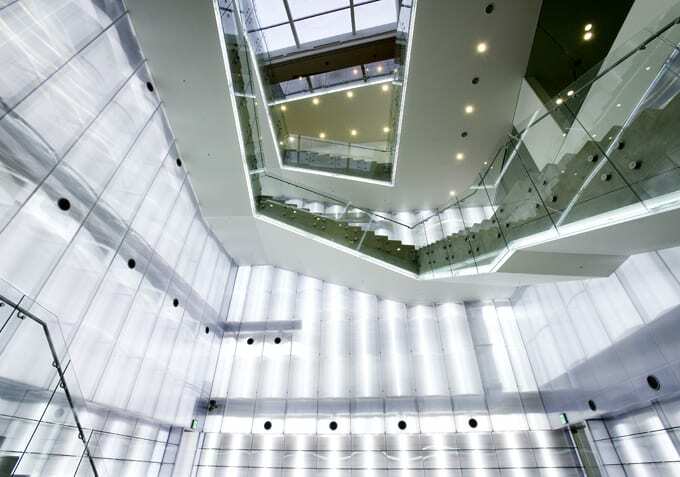 The unique cell structure of Danpal facades generates superior thermal insulation that significantly enhances a building’s energy efficiency. The Microcell structure of the panels offers the highest possible resistance to damage caused by hail and impact. This resistance is maintained despite the light weight of the materials, which gives them an impressive lifetime of service. Thanks to the snap-lock connection system, air and water aren’t able to penetrate the building’s exterior. The building enjoys higher load resistance as a result of the high security offered by the double “click” locking seam. With the top quality of its co-extended UV protection, the facade materials deliver a longer life. Installation is quick and simple, making the overall price cost effective for your budget. The novelty of living and working in a building that reflects its own unique image has made facade materials a dynamic form of architectural self expression. The colors that you choose will depend on personal preference and the style of the structure’s design. Also, it’s a good idea to choose colors that are easy to clean. Remember that facade materials give you a versatility that other traditional materials lack. You can use different shades of a particular color to produce a layering effect that creates an impression of depth. Or, if you want to make a statement, you can opt for a bold look that contrasts darks and lights along with different textures. The building needs to create harmony within its surroundings. That’s easy with facade materials; you can choose enhancements such as columns, feature lighting, and brick stacks so that your structure stands out. Natural light is an inherent feature of facade materials, much more so than it is in buildings that are designed from a traditional material. Thanks to the glazing panel’s unique structure, natural light is evenly diffused. Because of a design that’s created with architectural daylight applications in mind, the tight spacing between the ribs of the panels produces an appearance that appeals to the esthetic senses. Esthetics, affordability, durability and efficiency are all hallmarks of façade systems. Take a look at what’s in store for you! During the course of Danpal’s fifty years perfecting the art of building, we’ve seen how construction priorities have evolved over the decades. Now, today’s client expects the building that’s under construction to fit harmoniously into the landscape. It’s no longer merely about cost, although that remains an important aspect of the project. But right up there with the finances are energy efficiency, environmental sustainability, and appearance. Fortunately, Danpal has been able to stay ahead of the pack when it comes to developing façade materials that offer these elements. Although they’re relatively new in the building market, polycarbonate panels have reached a popular point where they’re already replaced traditional building materials. The old polycarbonate panels, which were too expensive and weren’t energy efficient, are a thing of the past. They now blend high-impact strength, UV protection, frame resistance, light transmission and anti-drop. And in addition to all of that, they’re beautiful to look at. Architects have been choosing polycarbonate panels because the flexibility allows them to be used in a variety of different forms. For an architect, being able to create innovative, highly functional designs means working in an element that transforms the structures they’re building. Clients evaluating different façade materials have the option of going the traditional route, or choosing our Danpalon® Microcell panels which provide ten times the number of cells than the majority of other façade material sheets on the market. Our Microcell panels are 100% leakproof, delivering thermal insulation and impact resistance for the ultimate in weather protection, translucency and strength. The Danpal panels are able to transmit an even diffusion of natural light. The spaces between the ribs of the Danpalon panels, which are available in varying range of widths and thicknesses, produce a unique iridescence that reflects and disperses light as no other façade material can. Danpal offers a biocolor option that makes it possible for clients to adapt the facades they’ve selected for a particular effect both on the inside and outside. All Danpal systems offer this feature. If you want bright colors with a metallic appearance, you can choose opaque panels that are available in a variety of tints. 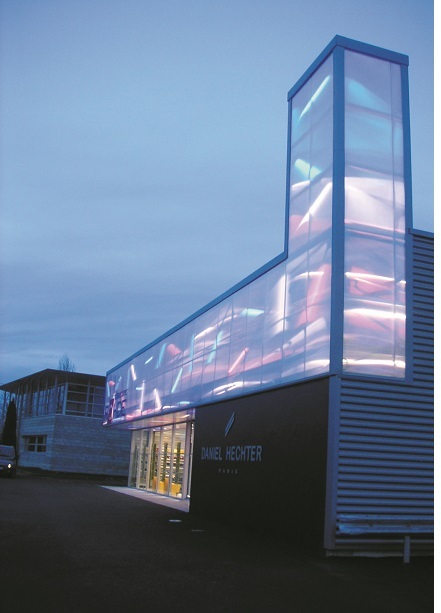 Thanks to the translucent range that Danpal offers, the building’s external appearance is transformed by the light and reflections that are projected onto the face at various times during the day. For bright colors with a metallic, lacquered appearance, choose the opaque panels available in a wide range of tints. 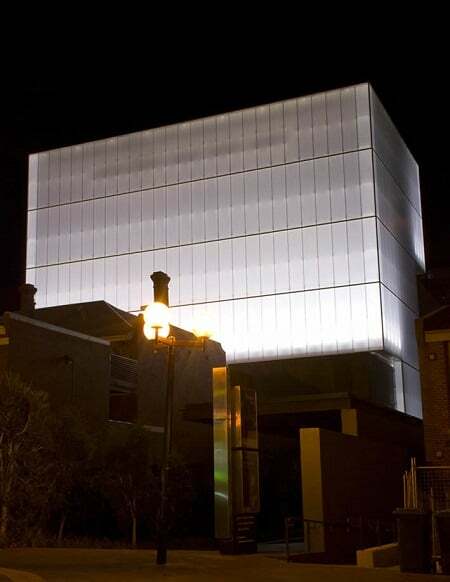 With Danpal’s translucent range, the appearance of the building changes with the light and reflections projected onto the facade at different times of day. Danpal has managed to deliver what architects love to provide for their clients: façade materials that integrate the beauty of the daylight world with the comfort and protection of top-of-the-line construction products. As a global leader in the design and manufacture of façade materials that harness natural resources in a cost-effective and environmentally sustainable manner, Danpal’s façade materials uses the latest in modern technology and the oldest source of illumination known to humanity the sun, to create contemporary structures that have the best of yesterday and today. Tomorrow is looking brighter with Danpal! Our products are so popular and so renowned that Danpal was presented with a new honor when ArchDaily, an online news source for the latest trends in architecture, named Hwa Hun, a structure that made extensive use of Danpalon, one of its “Top One Hundred” picks. Are dynamic and adaptive facade materials the way of the future? When it comes to spotting new trends and developments in an industry, it can be difficult to pinpoint exactly when a certain trend will start to kick in. This is why there are so many people on Wall Street every day trying to make these predictions, but only a few are ever right at any one time. There is no doubting that the world of constriction has been moving more towards a sustainable and environmentally friendly approach. The design process involves a lot more variables these days to judge the impact the structure will have on its surrounding environment, as well as looking at ways in which to minimise energy costs. One of the more exciting developments in the facade materials world is that of facade materials which are adaptive and dynamic. While renewables and other technologies have been becoming increasingly popular, these types of façade materials could be a key development. In certain areas of the word, most notably in North America, there has been a green revolution and designers have experimented with intelligent and dynamic systems which have a great impact when implemented together with standard technologies. These buildings are able to move, react and adapt to real life changing conditions. What would you say if a building could naturally react to changing environmental conditions and become optimised for any outcome? Tenants would surely be delighted at having a decreased carbon footprint and greater energy savings and efficiency. There will also be savings for the building owner in capital and operating costs. This could even be done without having to compromise at all on the visual aspects of the design and may even improve them. ‘Living building’ is becoming closer and closer to becoming a mainstream reality. Daylighting and solar shading used to be fixed systems on the roof or exterior of a building. Now there are possibilities of having them as dynamic and controllable systems that can react and adjust the changing environmental conditions. Being able to adapt on the go makes logical sense and once the numbers add up, this will go mainstream. There is no doubting the energy savings that can be used through the use of different façade materials, but here still needs to be affordable initial cost prices to make them viable for your standard building owner. At Danpal, we invest heavily in our research and development, so we are constantly looking at improvements and innovation in the field of facade materials. Solar and thermal planning for new building is essential in today’s energy market. Home owners and business owners have a vested interest in orienting their buildings – including location of doors, windows and energy creation – to make best use of local daylight and thermal conditions. Of course, this is going to vary from climate to climate, and geographical location. But some things will remain constant. These include changing of the sun’s angle by season, thermal gain due to sunlight on glass, and the need for shading options during seasons or in locations where strong sunlight is the rule. Locations that have seasons with extremely short daylight hours interspersed with extremely long daylight hours, that have little or no natural shade or that have a great deal of natural shade will require special treatment. With that said, Danpal building materials have a great deal to offer owners who are erecting new buildings. One viewer, upon seeing the Danpal website with its catalog of transparent, translucent and opaque building panels said, “Hey, look! It is the Earthship concept all grown up and made beautiful!” Indeed, the Danpal materials embrace ideas and research from earlier energy conscious builders. First of all, there is recognition of the need for façade materials for solar and thermal planning in new building that work efficiently and esthetically. Controlite is a Danpal system of translucent glazing materials with internal louvres that constantly adjust, allowing adjustment to a comfortable, no-glare interior that makes efficient use of natural sunlight. An easy-to-install facade solution is Danpatherm, a factory assembled unit that incorporates excellent thermal properties with tensile strength that can resist wind and dirt penetration. During the day, it functions as a wall panel that emits natural light. Fitted with LED lighting, at night it works as a light box. The combination ensures pleasant lighting at all times. 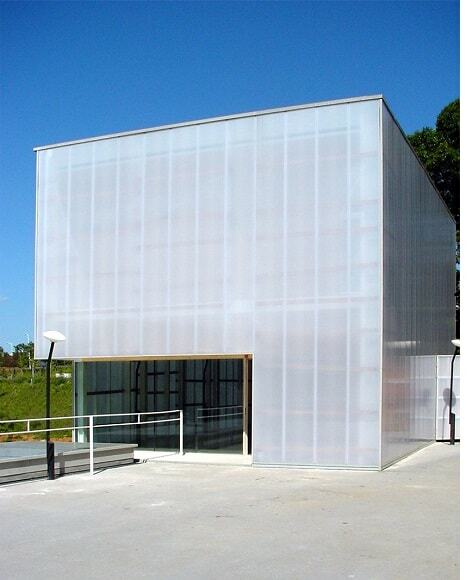 Finally, there are the Danpal translucent façade panels. These combine light weight with tensile strength; weather resistance with ease of installation. They come in a variety of colors and styles, enabling mixing and matching for unique external building designs; in addition, they provide excellent solar and thermal protection, admitting light while blocking harmful UV rays and managing thermal gain. Combined with a lightweight metal framing system, they are a highly secure means of admitting natural light, and creating an attractive nighttime display of light and color without compromising privacy. Second, Danpal transparent and translucent roofing panels create a constructive, incredibly beautiful answer to the architectural question of how to make skylights – a superb way to get natural lighting into a building – secure and weather resistant. Incorporating the same tough materials and practical building options as the façade materials, Danpal roofing can bring daylight to any room or area that is on the top floor of a building. Furthermore, because it is roofing, rather than an inset window panel, visual interest is achieved by organization and arrangement of the roof supports. For those who would love to look at the stars while falling asleep, without the inconvenience of wind, rain, dust and insects, this is the ideal solution. As for that old movie cliché of falling through the skylight, Danpal roofing systems are designed for a wide variety of weather conditions and are impact resistant. Finally, Danpal panels include shading solutions for solar and thermal planning in new building. Sunlight is marvelous for lighting rooms or even for thermal heating solutions, but there are times when enough is enough, and sunlight simply isn’t welcome. For those areas, Danpal translucent louvered shades are the perfect solution. They can be adjusted by the user, and can be set for a broad variety of effects. They come in a wide range of colors. Their jewel tones are not dissimilar to those of a stained glass window – just not quite as ornate. More importantly for the modern user, the panels can be adjusted to that just-right lighting for a particular interior. They shade without gloom, and admit the right amount of natural daylight for that uplifting feeling that comes only from sunlight. The Danpal systems are designed for efficiency, security and beauty. They can be used for basic Frank Lloyd Wright building styles or incorporated into older or newer types of architecture. With these versatile panels, with their wide array of colors, their unique thermal properties and their modern building systems only the builders’ imagination will limit their applications.